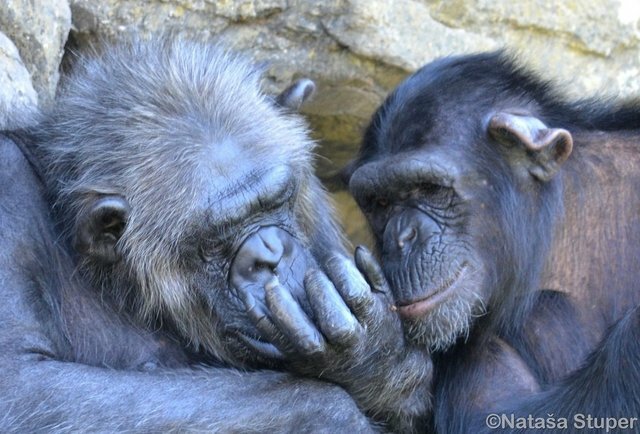 Like humans, chimpanzees too need a friend who has their back -- even if just to groom it. But when it comes to close friendships, the similarities don't stop there. According to a new study from cognitive biologist from the University of Vienna, our primate cousins aren't simply social animals, they're actually quite particular when it comes to picking their friends. Researchers observed captive chimpanzees in two Dutch zoos, analyzing the personality traits of each. Next, they studied to see which of the chimps to spent the most time with one another -- relaxing, grooming, making physical contact -- indicators that the pair are best friends. As it turns out, chimpanzees prefer friends who are the most similar in temperament, a phenomenon known as the "similarity effect" observed in the closest human relationships. "We found that, especially among unrelated friends, the most sociable and bold individuals preferred the company of other highly sociable and bold individuals, whereas shy and less sociable ones spent time with other similarly aloof and shy chimpanzees," says researcher Jorg Massen, in the study published in the journal Evolution of Human Behavior. "What draws both chimpanzee and human friends together is similarity in gregariousness and boldness, suggesting that preference for self-like friends dates back to our last common ancestor." While there's still much to be discovered about the complexities of chimpanzees' emotional lives and how it compares to our own -- it's reassuring to know that simple joy of having a best friend is at least one commonality which binds us.